This hydroponic humidifier system is designed specifically to create the perfect humidity levels for mushroom growing. It generates fresh filtered humid air to any fruiting chamber without over saturating. No need to drill shotgun style holes in your container. This system will automate a growing setup of any size. Highly recommended when growing a large quantity of jars or bulk casing setups where perlite can’t be used. (ON SALE NOW!) 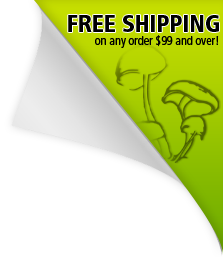 This hydroponic humidifier system is designed specifically to create the perfect humidity levels for mushroom growing. It generates a slow steady stream of fresh filtered humid air to benefit any fruiting chamber without over saturating. No need to drill shotgun style holes in your container. This system will automate a growing setup of any size. Highly recommended when growing a large quantity of jars or bulk casing setups where perlite can’t be used. This humidifier works by pumping air through an in-line HEPA filter and into the hydroponic water reservoir which creates thousands of water droplets that attach to the synthetic fibers. These droplets constantly evaporating creating natural humidity which is pumped into the fruiting chamber. Add this to any Bulk Casing Grow or setup where additional humidity and fresh air is needed! Will be a few weeks to go, but In my experience with such things, this is well thought out and simple. High quality and great support form Midwest. 5 stars based on all things I have used form them in the past. This is a winner. This setup is great! It actually really a simple system that was cleverly put together. I added this to my monotub since it was getting dry after the first flush and have been running this 24/7 since. The mycellium was looking dry/bluish and after adding this I can see it now turning back to whiter color. Its only been a week but the mushrooms seem to be fatter this flush, I cant confirm it was from this, but it seems to be helping! Best $30 I spent! Its hard to feel the air coming out, but if you take a lighter to the end of the hose, its flickers like crazy, so its working!! Exactly as described and it works great!!! I am a first time grower and had no idea where to start. Midwest Grow Kits had everything I needed and more. Excellent products, excellent service and fast shipping. Midwest Grow Kits always has exactly what I need at decent prices. This purchase was a pump, but even the kits are a great deal. Piecing together everything you need is time consuming and costly. I always make a stop here before I shop anywhere else. Shipping is super fast and super discrete. I haven't had any problems yet. No success until I shopped here.